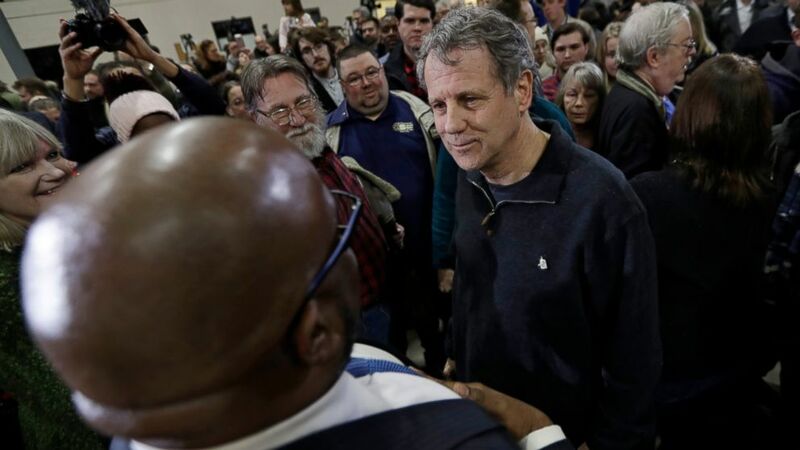 Sen. Sherrod Brown on Wednesday kicked off his tour of states that cast pivotal early votes in the 2020 presidential primary by accusing Republican President Donald Trump of "phony populism" that disrespects minorities, workers and families while benefiting billionaires. The Ohio Democrat launched his "dignity of work" tour at a warehouse south of Cleveland. He and his wife, journalist Connie Schultz, head next to Iowa, New Hampshire, Nevada and South Carolina. "When work has dignity, we honor the pensions people earned," Brown said. "When work has dignity, everyone can afford health care, education and housing. They have power over their schedules and the economic security to start a family, pay for daycare and college, take time off to care for themselves or their families when they're sick, and save for retirement." "You talk to some of the older people, and it would be great to get some of the deals they had," he said. Christopher Mobley, 18, said the College Democrats at the University of Akron, of which he's a part, are excited to support Brown "because he's someone that's not going to take anything from Trump." Brown accused Trump of betraying workers, claiming the president "has not lifted a finger" to help threatened workers at General Motors' Lordstown plant. "Donald Trump has used his phony populism to divide Americans and to demonize immigrants. He uses phony populism to distract from the fact that he's used the White House to enrich billionaires like himself," Brown said. "Because real populism is not racist; real populism is not anti-Semitic; real populists don't engage in hate speech and don't rip babies from families at the border." "Sherrod is the one candidate who's like an old-school Democrat, that hasn't forgotten where the Democratic Party started," said Teamster Fred Crow, 57, of Maple Heights. "Sherrod's the one guy that's been with us from the beginning." "He hornswoggled us," said Albert Stapleton, 73, a retired Teamster and 2016 Trump voter from Brunswick. "He went 180 (degrees) out on everything that he campaigned on." Crow said: "Mr. Trump is the drunk at the end of the bar. He's going to tell you what you want to hear."